Lauren & David’s wedding is only 3 short weeks away, and I’m counting down the days until these love birds tie the knot! As downtown Austin continues to grow at a rapid pace, I continue to love searching for cool new session spots to photograph at. I ❤️ finding new locations downtown to create memorable and unique images for my couples! 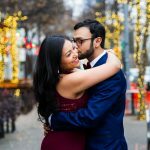 We had such a blast walking around downtown Austin creating these Seaholm Power Plant engagement photos, and I know their wedding day will be just as much fun. Stay tuned for the wedding photos coming to the blog soon!